About 6 1/2″ long. Dark brown upper parts with circular white spots. A collar of mixed blackish brown and white around the back of the neck. White throat. Mottled brown band on the breast. Brown and white barred tail. Black streaks on gray white underside. Inhabits forests (usually coniferous) from the eastern slopes of the Rocky Mountains to the Pacific Coast from Mexico to British Columbia and Alberta. 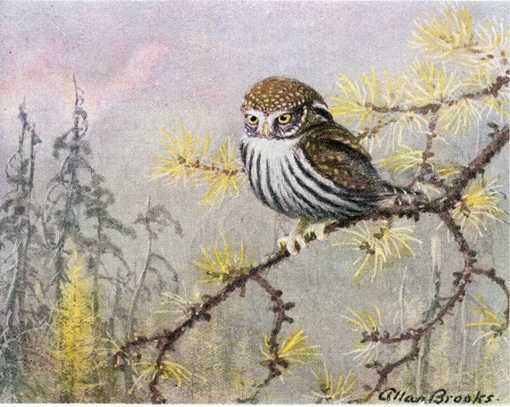 Similar Pygmy Owl species inhabit northern Europe and South America. Day hunter of small birds, rodents, reptiles and insects. Swift jerky short flights similar to woodpeckers, often from tree to tree. Builds nests of a few twigs and feathers in natural or abandoned tree cavities up to seventy five feet high and in nest boxes. Lays three to six white eggs which hatch which after about one month incubation and young leave the nest in about another month. The Pygmy Owl Birdhouse (same as for Saw-whet Owl, Lewis’s Woodpecker, Flicker, and Grackle) has a 7″ by 7″ floor, 16″ inside ceiling, 2 1/2″ diameter entrance hole located 14″ above the floor and ventilation openings. Mount this nest box out of reach (10 feet or higher) near woodland edges or clearings.